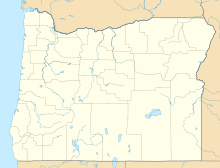 Alderwood State Wayside is a state park on Oregon Route 36 in the state of Oregon. Administered by the Oregon Parks and Recreation Department, the day-use wayside covers about 76 acres (31 ha). It is open year-round and attracts about 45,000 visitors annually. The state acquired the land for the park from Lane County in 1931, and the Civilian Conservation Corps developed the picnic site in about 1935. Amenities include picnic tables, toilets, and a hiking trail along the Long Tom River, which flows through the park. Flora at Alderwood includes big Douglas firs, Pacific dogwoods, bigleaf maples, and other trees. Smaller plants, especially lush in spring, include trillium, yellow violets, and bleeding hearts, ferns and mosses. Among the fauna observed here are kingfishers and cutthroat trout. ^ "Alderwood State Park". Geographic Names Information System. United States Geological Survey. Retrieved June 21, 2011. ^ a b c d e f g "Alderwood State Wayside: History and FAQ". Oregon Parks and Recreation Department. Retrieved April 23, 2016. ^ "Alderwood State Wayside". Oregon Parks and Recreation Department. Retrieved April 23, 2016. ^ Bannan, Jan (2002). Oregon State Parks: A Complete Recreation Guide (2nd ed.). Seattle: The Mountaineers Books. pp. 140–41. ISBN 0-89886-794-0. This page was last edited on 23 October 2016, at 21:40 (UTC).